Apple TV is useful for trialing Geckoboard and TV dashboards before using more suitable hardware. This article guides you through using Apple's AirPlay and Apple TV feature to display your Geckoboard dashboard on a TV screen or monitor. On your Mac, open a browser and log in to your Geckoboard account. Navigate to the Dashboard you wish to display. Open a new browser window and paste and copied link into the address bar, then hit Enter. Your dashboard will now appear on your screen. Click the AirPlay icon in the menu bar at the top of your Mac's screen. 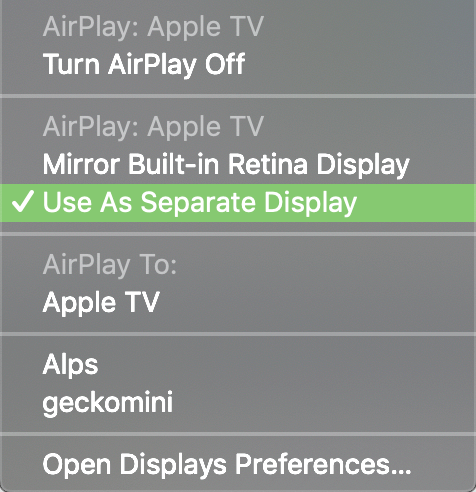 If you don't see the AirPlay icon , go to Apple () menu > System Preferences > Displays, then select the Show mirroring options in the menu bar when available checkbox. Select your Apple TV. If you don’t see your Apple TV, make sure that your Mac is connected to the same Wi-Fi network as your Apple TV. Click the AirPlay icon in the menu bar, then select Use As Separate Display. Click and drag the Browser window with your dashboard right across your screen until it appears on your TV screen. Hover over your dashboard and click the full screen icon  in the top right hand corner. You should now see your dashboard displaying on your TV! To cycle through multiple dashboards on your TV screen, you can create a dashboard loop.